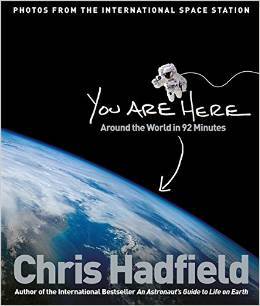 Meet Chris Hadfield: the former Commander of the International Space Station will be signing copies of his stunning planetary photo tour You Are Here: Around the World in 92 Minutes. 12.30pm, Waterstones West End, Princes Street. Please arrive early to avoid disappointment. For more information call 0131 226 2666. Sparkly bracelets! A free Christmas craft event for ages 4+. 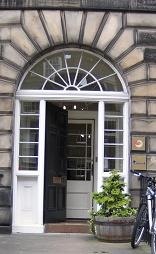 3.30-4.30pm, Stockbridge Library, 11 Hamilton Place. extending your reach: a sound art workshop. An introduction by Martin Parker to the powerful world of MaxMSP. Open to all gallerists, technicians, students, curators, academics and teachers. As an introductory workshop this session is intended to expose those with an interest in sound, sonic art and live electronic sound to some of the processes behind realising and presenting sound art. Bring a laptop and headphones and install MaxMSP on your system first. 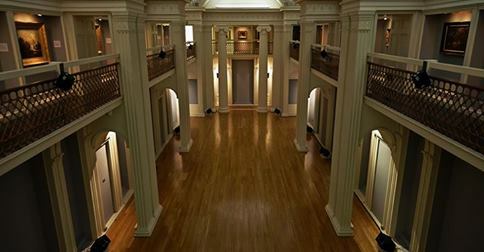 2-4pm, Talbot Rice Gallery, Old College, University of Edinburgh, South Bridge. Free but registration is required via eventbrite. For more information and for a link enabling you to download MaxMSP, see the gap in the air website. Glamour and the Baybes: high-octane electric six-piece fronted by Alex Munro. Funk-fusion versions of Nirvana, Tower of Power, Massive Attack, Snarky Puppy and more. 11.30pm (entry from 10.30pm)-3am, The Jazz Bar, 1a Chambers Street. £3/£2 on the door, cash only. LGBT Drop-in: informal weekly gathering for LGBT people. Come in for a cup of tea and a chat, meet others in a friendly, relaxed, welcoming environment, and find out what is happening at the Centre and in the community. 5.30-8pm, LGBT Health & Wellbeing, 9 Howe Street. For more information call the centre on 0131 523 1100 or email admin@lgbthealth.org.uk. NB: there will be no drop-in on 22nd or 29th December. 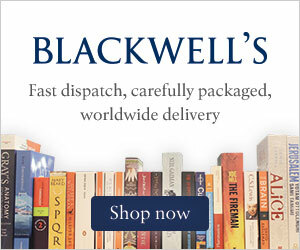 Blackwell’s Edinburgh Adult Book Group: join the group for lively, friendly chatter – no previous experience necessary! Currently reading John Irving’s The Cider House Rules (next month: Donna Tartt’s The Secret History). 6-8pm, Blackwell’s South Bridge. If you would like to take part, email your details to events.edinburgh@blackwell.co.uk. North Edinburgh Grows Christmas Tree Lights Switch On. 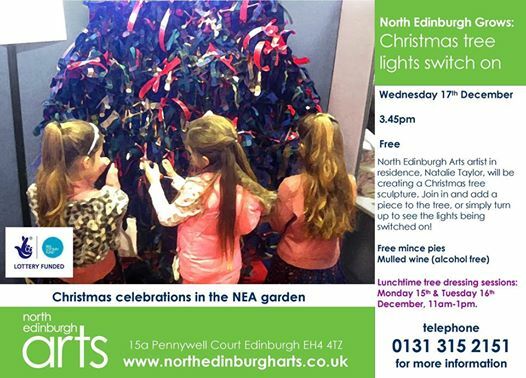 North Edinburgh Arts Artist in Residence Natalie Taylor will be creating a Christmas tree sculpture today and on Tuesday – come along on either or both days to add a piece to the tree, then come back on Friday to see the lights being switched on! 11am-1pm, North Edinburgh Arts, 15a Pennywell Court. (Lights will be switched on at 3.45pm on Friday, when refreshments will also be served). For more information call 0131 315 2151. Blackwell’s Edinburgh Children’s Book Group: if you are 8 to 11 years old with a love of books and biscuits, join the book group and enjoy a friendly hour of fiction and chat! 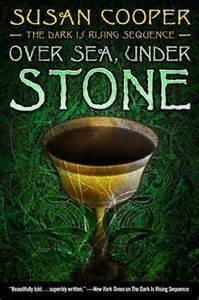 Currently reading Susan Cooper’s Over Sea Under Stone. 6-8pm, Blackwell’s South Bridge. If you would like to join, email your details to childrens.edinburgh@blackwell.co.uk. Music Among The Trees: Dovecot Singers. Talented local vocal group Dovecot Singers entertains visitors to the Edinburgh Christmas Tree Festival. 2-3pm, Sanctuary, St Andrew’s and St George’s West Church, 13 George Street. Free: all welcome – come and go as you please. Coffee Club: tea, coffee, home baking and a warm welcome to all! 10-11am, Session Room, Portobello and Joppa Parish Church, Brunstane Road North. £1.50 per person. The group also arranges four outings a year to places of interest in Scotland. Leith Central Community Council: 7pm, McDonald Road Library, 2 McDonald Road. 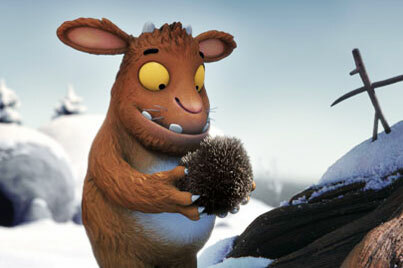 The Teapot Trust returns with The Gruffalo’s Child! And a few special prizes for the lucky one. For ages (approx) 1-4. 9.30am, Cameo Cinema, 38 Home Street. £5 (includes a £2 donation to the charity) – free for parents/carers who join the free Toddler Time Club. Book online or call the Box Office on 0871 902 5723. Toddler Time screenings are for pre-school children and their parents/carers only. The 10th Portobello Book Festival is here!